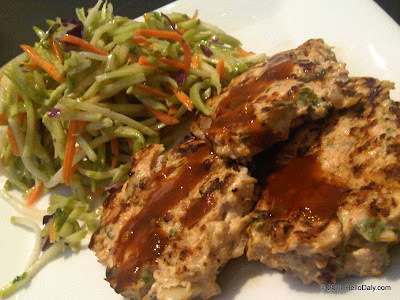 I made these garlic-chipotle chicken patties and some shredded broccoli slaw. Then John had the idea to put them on sweet rolls. Recipe below. Combine everything together in a large bowl and mix well until combined. 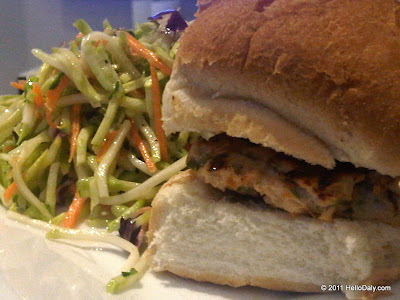 Make in to patties and grill. I made the recipe up and it's not exact so adjust more or less depending on your taste. Even if you omit or substitute an ingredient I'm sure you'll be fine. Anyway, toss dressing with a bag of shredded broccoli mix, chill in the fridge before enjoying.